Click here to get your free samples of Download Unstopables. You love the softness of Downy. 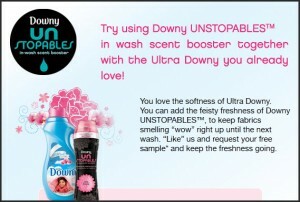 Add the feisty freshness of Downy UNSTOPABLES, an in wash scent booster that goes beyond everyday freshness to keep active wear, towels, and other fabrics smelling “wow” right up until the next wash. So every day, you can indulge in the freshness you crave. Just pick a scent below. Then see how to use UNSTOPABLES—and what makes it so fresh, easy, and fun.